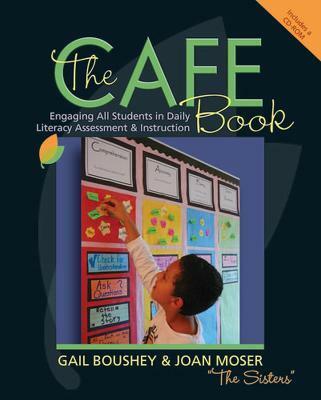 In The CAFE Book, Gail Boushey and Joan Moser present a practical, simple way to integrate assessment into daily reading and classroom discussion. The CAFE system, based on research into the habits of proficient readers, is an acronym for Comprehension, Accuracy, Fluency, and Expanding vocabulary. The system includes goal-setting with students in individual conferences, posting of goals on a whole-class board, developing small-group instruction based on clusters of students with similar goals, and targeting whole-class instruction based on emerging student needs. Gail and Joan developed the CAFE system to support teachers as they: organize assessment data so it truly informs instruction; track each child's strengths and goals, thereby maximizing time with him or her; create flexible groups of students, all focused on a specific reading strategy; and help students remember and retrieve the reading strategies they learned. The CAFE system does not require expensive materials, complicated training, or complete changes to current classroom literacy approaches. Rather, it provides a structure for conferring with students, a language for talking about reading development, and a system for tracking growth and fostering student independence. The CAFE system's built-in flexibility allows teachers to tailor the system to reflect the needs of their students and their state's standards. And it's a perfect complement to The Daily Five, "The Sisters" influential first book, which lays out a structure for keeping all students engaged in productive literacy work for every hour of every classroom day. "The CAFE Book would be a great resource for teachers looking to try a new approach to teaching literacy. " - Education Review ""The CAFE Book" would be a great resource for teachers looking to try a new approach to teaching literacy. " - "Education Review"
Gail Boushey's work as a literacy coach and author is based on her classroom experiences, which range from preschool through grade six and special education. She obtained her undergraduate degree in Elementary Education, Child Studies and Special Education and has a Master's degree in Special Education. "I want what every teacher wants: effective teaching methods that can adapt as things change, and to lead our children to a lifetime of learning." Gail has three daughters and enjoys concerts, camping, reading, and cooking. Joan Moser's passion for meeting each child's individual needs by discovering where they are and guiding them forward has been practiced and refined in a variety of classroom settings. She has taught kindergarten through sixth grade, special education, and is a certified Reading Resource Specialist. Joan obtained her undergraduate degree in Elementary Education and Early Childhood Development and her Master's degree in Reading. When her nose isn't buried in a book and her fingers aren't flying over the keyboard writing, you will likely find her golfing, gardening, or hiking with her husband and her puppy.